Datuk Bernad Francis is/was the General Manager of Network Revenue Management of our Malaysian Airlines. He also held/holds the influential post of route planning for the national carrier. Route planning, according to industry sources, is one of the main nerve centers of the aviation business that could make a break a company. But is this Datuk the same guy who used to be AirAsia’s senior manager of Purchasing and Distribution, and also the cheap airline’s former Route Manager? If it is the same person, what is he doing in MAS then? Sitting in MAS’ engine room throwing spanners into the system? Sources say a certain senior manager in MAS has been transferred to another department after his dubious moves that were detrimental to MAS’ business was uncovered by undercover investigators engaged by the top management. Some say the guy was actually a mole for a competitor who had been planted in MAS, even before Datuk Seri Idris Jala came into the picture to resuscitate the Pride of Malaysia. Another not-so-little-bird says he is also a close relative of the competitor’s CEO. Can somebody tell me WHO THIS MOLE IS? Is this Industrial Espionage or Sickening Sabotage? I wonder if these allegations/claims are vicious lies or hidden truths, but my suspicion often trails desperate and overly ambitious human beings. Bernard Francis (now a Datuk) and Kaneswaran Avili are two ex-AirAsia DIRECTORS who joined MAS in January 2005. 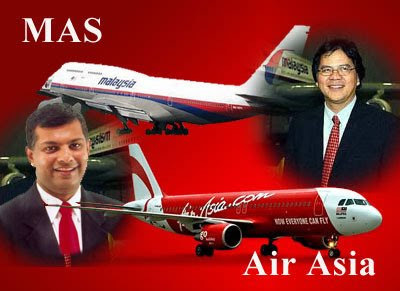 It appears as though the TWO AirAsia Directors were recruited by MAS’ new Managing Director Datuk Idris Jala whose appointment took effect on Dec 1, 2004 BUT sources say the duo were planted in the MD’s Office by ‘outsiders’ via higher authority. They say maybe MAS Chairman Tan Sri Munir Majid may know a thing or two, about the planting and re-planting, since some trails were allegedly leading to his door. I wonder what happened to Kaneswaran Avili's fate in MAS but the former AirAsia Director of Sales&Distribution is now in the good company of Tony Fernandez, Kalimullah and friends. Kaneswaran is not onlt the Chief Operating Officer in Tune Money, but he is also a substantial share-holder. Is that our Datuk Bernard who is clickin away, flanked by a sultry stewardess from his left. p/s The fact remains that the 'Hindu God-Muslim Priest' is all around us ... or more acurately around OUR MONEY? It has been long established that Kalimullah Maseerul Hassan is a spy. So is Brenden Pereira who briefs Lee Kuan Yew every month. These two will be arrested, charged and put away for good when the next Government takes over. You see, the Special Branch failed Kalimullah when he wanted to become Press Secretary to the late Tun Ghafar Baba when he was Deputy Prime Minister. (Of course, Kalimullah wanted to get some projects from Ghafar too). You see, Kalimullah is not very well educated. He can't even do simple maths. He will die on his own. That's why he sticks to politicians like a leech. He will get projects from these politicians and Ali Baba it to Chinamen. He can't do the projects himself because he is stupid. Now he is resigning as Deputy Chairman of NSTP because he had failed to increase the circulation of the NSTP newspapers. NST and Berita Harian are worse off than what they were in 2003. Poor vendors. They are crying. I also heard Hishamuddin Aun is lobbying to keep his post. He is now telling people that he is not Kalimullah's man. You know why? When Najib takes over, he can easily say "I am Najib's man". Hishamuddin is as corrupt as Kalimullah is. His wife owns Casa Impian. He has been going around getting Ministers to give projects to his wife. He also uses Berita Harian to promote his wife's business. In about 4 months, the ACA will be after Hishamuddin. At least two charges for sure. And he is looking at 5 to 10 years imprisonment. MAS should do some soul searching first before pointing fingers at this and that - mole-lah, spy-lah - others but themselves. Air Asia tu LOW COST CARRIER! yang depa nak pi compete dengan LOW COST CARRIER tu buat apa? Patutnya benchmark yang harus diterimapakai oleh MAS ialah standard of service offered by the likes of Singapore Airlines, Emirates or British Airways. Aku duduk jauh dari Malaysia, cukup menyampah bila naik kapalterbang MAS dengan cabin crew yg tak berapa nak layan aku sbb aku ni bukan orang putih, walaupun duduk negara orang putih. Dengan makanan yg kononnya world class tapi rasanya kucing nenek aku pun tak lalu nak makan. Bukan aku sorang aje yg komple, kawan2 lain sama. Foreigner pun komplen sama... Nak dijadikan cerita, aku ni pompuan pakai tudung, insyaAllah Muslim, budak pramugari Melayu tu (Muslim jugak kot) offer wine kat aku. Kepala hotak dia! Sedangkan aku naik airline kepunyaan orang putih pun reti kasi aku Muslim meal! Kalau nak jadi INTERNATIONAL airline, kenalah hapuskan sifat dengki kat orang lain. Jangan nak salahkan org lain aje. Lepas tu tambang naik turun ikut suka hati dia! Mentang2 tak banyak saingan untuk some destination, sampai RM10,000 untuk 1 tiket ekonomi. Baik aku kasi duit tu kat anak-anak yatim Palestin! Hey if he is in charge of Network Revenue, would he be the person who is responsible for pushing out low fares from MAS? Is he the same person who is introducing all these new initiatives related to pricing? So we have HINDRAF in the streets HINDU spies in the air, and HINDU money-makers in NST ? Apanama, You would think MAS would do background checks on key officers to be recruited - funny to think that an award winning organisation like MAS fails in the simplest of processes - or are they hidden hands behind? What MAS is doing is great - special fares at certain times of the year - but MAS is not competitive anymore-too much of this 'low cost' style tactics are all short term gains but will erode the yield.MAS international fares are highest in terms of fares. With many options for travvellers, we will soon abandon MAS for screwing international fares whilst trying to ape and fight a low cost- for what?? Look at Air Asia's accounts/balance sheets - not much to scream about lah. MAS giving out low fares is good - gives a fight to Air Asia fornot getting too arrogant. I travel on regular business trips within Sabah/Sarawak and Kuala lumpur = sometimes Air Asia fare is higher than MAS. so its good, MAS please continue with some 'specials'. Dear Bung Karno, kalau dah nama depa Mullah, Tony, John, Bernard ... bukan Hindu la brader. This is not a race or religious issue brader. We have PROSTITUTES from every race ands religion in this world .... kurang lebih macam itu lah kot. IS IT TRUE KALIMULLAH DAN KAWAN-KAWAN ARE TRYING TO MERGE AIR-ASIA DENGAN MAS, LEPAS TU NAK MANAGE THAT MERGED ENTITY. DENGAR KATA AIRASIA HAMPIR 'TERBALIK' SEKARANG DAN JIKA TIDAK 'DI-BAIL-OUT' AKAN LINGKUP PADA PENGGAL PERTAMA 2009. WE SHALL WAIT AND SEE, BETUL ATAU TIDAK. Alamak, Msians ni kuat jealous. Why is it that every time we see someone doing well, we insist on `ketuk-king' them? No wonder they say that Msians think they are world class, but they actually have 3rd class mentality! Muslihat siapa ni yang cuba kotorkan imej MAS? MAS like any company that is managed by short term CEO (short term here is 2 to 4 years)will be looking at restructuring the books and get better cash flow. For what ever reasons, budget air fares maybe one way to achieve this. However, its Brand has always been in service levels and was competing with Singapore Airlines and KLM. It is unfortunate that this Brand value (which has been built since umpteen years) gets eroded and relegated to just another budget airline. So strategicly, perhaps MAS may need to look elsewhere to preamp their lacklustre performance. If someone is doing good, lets cheer them along. Not hit them into the ground. YES! If they're doing GOOD, yes we should cheer them along. What if that very 'someone' are actually robbers who have when masquerading as businessmen? Cheer them or jeer them?